You know that saying, "it's not over until the Fat Lady sings?" Well, we think it may have been invented by a Gryffindor at Hogwarts! So don't cut your Halloween short; the portrait of the Fat Lady will bellow to let you know it's time to turn in from your trick-or-treating extravaganza or to return home from a special All Hallows Eve Ball. And once you take off your face paint and fold your costume into your trunk, you can slip into these Harry Potter Gryffindor Slippers for Adults and sit around the common room fire, divvying up pumpkin pasties, chocolate frogs, and every flavor beans with your best buds! How wonderful does that sound? 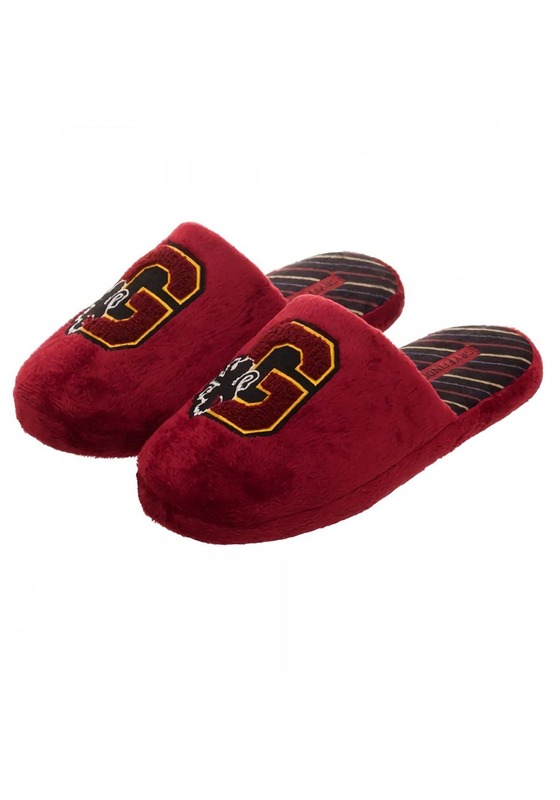 These licensed slippers are easy to slide on and show off your house pride. And really, as a Gryffindor, what's not to be proud of? These shoes are crafted from fuzzy crimson fabric, with the Gryffindor "G" and lion emblazoned on the top. Keep your toes warm and your loyalties known, even in your downtime! A lot of people don't know this about Gryffindors, but in addition to being brave, loyal and determined, they are also predisposed to love those feel-good, cozy vibes. Truly! Something about the lion in you wants to cuddle up in your den, so don't fight it this Halloween. Just listen for the Fat Lady and then turn in to tuck into these great slippers!